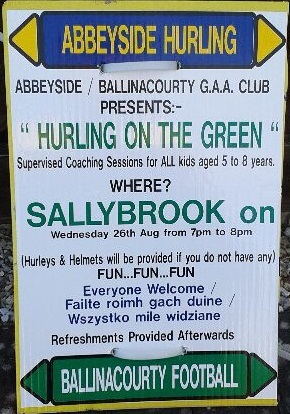 'Hurling on the Green' continues this Wednesday evening, 26th August between 7:00pm and 8:00pm in Sallybrook, Abbeyside. All children from 5 to 8 years of age are welcome to attend. Hurleys and helmets will be supplied for those needing them. Refreshments will be provided afterwards.